Do you remember your Christmas's as a kid? My parents divorced when I was younger, so some of my earliest memories are of having both my parents together on Christmas Day, however a lot of them aren't. One thing I can say about all my memories of Christmas as a kid though, is that they were happy. Traditionally, even after my parents divorced, all of my mums side of the family would get together for Christmas at my grans house. Now when it comes to Christmas, Granny Annie knew how to do it! My gran had thee most amazing, traditional decorations; she would, of course, have a main tree which would be colourfully decorated with multi-coloured fairy lights. She would hang gold and red foil decorations from her living room ceiling. Her wooden banister and spindles would be decorated with tinsel of all colours. My gran was an exceptional knitter, she would knit dolls in the shape of firemen, butchers, even one in a tux! - they were amazing! One of the two decorations I remember the most was her hand knitted manger scene, it would always sit at the bottom of the tree - taking pride of place! You knew it was almost Christmas when the manger came out - it was an incredible piece of work, even complete with a tiny baby Jesus in the crib. The second of her Christmas decorations I remember the most and personally, my absolute favourite, was her Christmas village scene, it was a group of five or six small village houses and buildings, I'm not too sure what they were made of, although they were solid so possibly some sort of resin. Each one had a little hole drilled in the bottom to allow you to insert a fairy light in to illuminate them. There was something quite magical about that village scene, I've looked for one like it for years and haven't found anything with the same...meaning. In my teens I lived with my gran for a while and my windowsill was the chosen one for displaying the village scene. One year in particular we had an extremely heavy snowfall and I remember sitting on my bed with the lights off and only the lights from the village scene were on. Together with the snow fall out side it was just an incredibly relaxing, magical moment. This memory has stuck vividly in my mind since. My grans kitchen and dining room were joined by a small wooden window half way up the wall, with saloon style doors, we used to call this the 'bole hole'. Plates of food would be passed through the bole hole from the kitchen and passed round the table. Every year, my gran would make 3 starters, usually egg mayonnaise; a boiled egg cut in half long ways on a bed of salad, covered in 'Annie's Sauce' and sprinkled with cayenne pepper, she would do a traditional prawn marie-rose and a big old pot of home made soup. Main course would be turkey with all the trimmings of course - including brussels - I LOVE brussels. Please no abuse, they are not that bad. Desert would be homemade Christmas cake (which my sister and I used to be allowed to help make!) a strawberry trifle and profiteroles with mars bar chocolate sauce. YUM! After my parents divorce, we still went to my grans for family dinner, however in the morning we would go and visit my dad and spend some time with him, he would always have a huge Santa sack filled with gifts for both my sister and I. He had a large patio window and he would put his tree right in front of that each year, my sister and I would help him put the tree up and decorate it. I had absolutely nothing to complain about - I got two lots of presents each year! After gorging ourselves with Christmas dinner, the adults would move through to a more comfortable seat in the living room and enjoy a small tipple, usually a liqueur or a wee sherry and they would talk and laugh about years gone by while us kids played with the toys Santa had brought us. I do realise that I am exceptionally lucky to have such happy memories of Christmas as a kid, I know that not everyone is lucky enough to have had the same experience as me, however I couldn't have asked for happier memories; it's instilled a magic in me for Christmas that has never left. 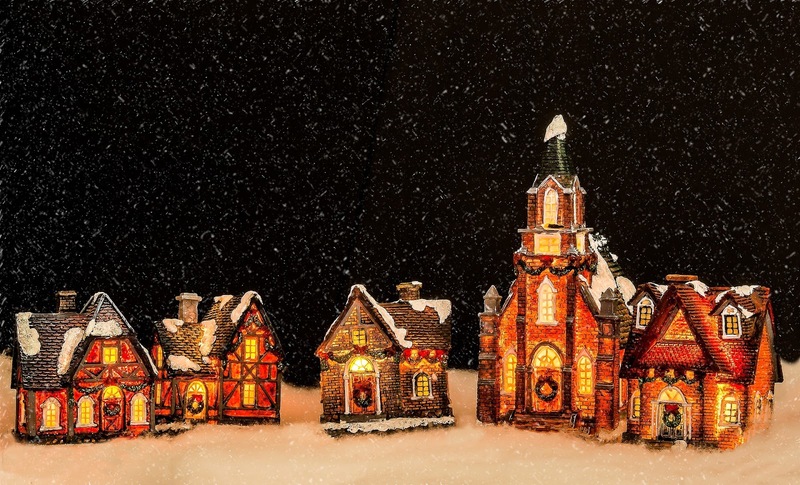 Do you have any memories of Christmas as a child? If so I'd love to hear them!